Freediving Gold Coast runs a special freediving course every Monday from 8 to 5pm that takes beginners beyond snorkeling to introduce the magic of freediving at the Gold Coast Seaway. 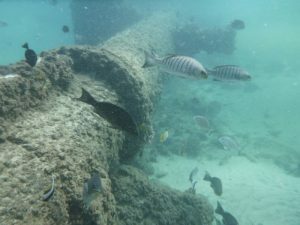 The Gold Coast Seaway has been described as the best land based diving site in Queensland with over 200 species of fish. Why snorkeling Gold Coast when with Freediving Gold Coast you can learn to freedive beyond 5 metres of depth and get up close and personal to the fish life of the Gold Coast Seaway. No other snorkeling company on the Gold Coast offers this challenging adventure. How long can you hold your breath while being super calm? How deep can you dive? Are you up to the challenge? Free pickup from your hotel in Southport or Surfers Paradise to our site at the Gold Coast Seaway. Practicing dry breath holds (i.e., on land). Practicing static (no movement) breath holds in the water. Diving on the Pipe (a well known fish area in the Seaway) or drift diving over some 400 metres of the Seaway rock wall (depending on currents and conditions). An electronic PDF manual of freediving from AIDA International, the world freediving body. On successful completion of all criteria students are certified as AIDA 2 Pool Freediver with AIDA International (this $30 fee is included in your course fee). To make a booking, please following this link to our Intro Freediver course and choose a date for the Intro Freediver at Gold Coast Seaway.